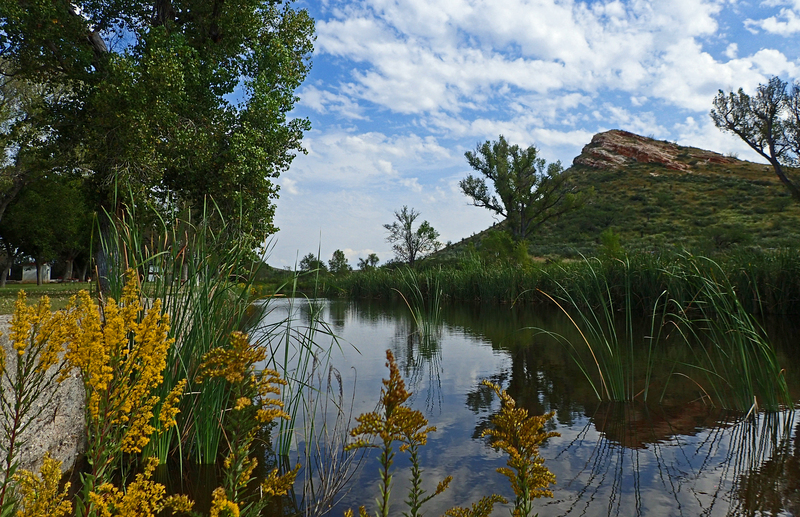 Post Park is a Big Bend Oasis for birding, picnics, bbq, dancing, camping and more! Post Park is a county park and Big Bend oasis, located 5 miles south of Marathon at the winding, southern end of Avenue D. Massive cottonwood trees, fed from perennial springs, shade a large lawn with picnic tables and grills, free to use. The maintained public restrooms are open 24/7, and camping is allowed on the east side of the spring-fed pond, as long as guests take care to clean up and respect the area. Before operating as a county park, the site was chosen as a U.S. Army outpost in the 1800s, thanks to the regular and abundant supply of water. The Army protected train interests from bandits, horse-thieves, and Apache raiders in the Big Bend vicinity. The Camp’s occupants included the Tenth United States Cavalry, also known as buffalo soldiers. Visitors can learn more about the illustrious history of this incredible wellspring from several historical signs posted at the park’s entrance. 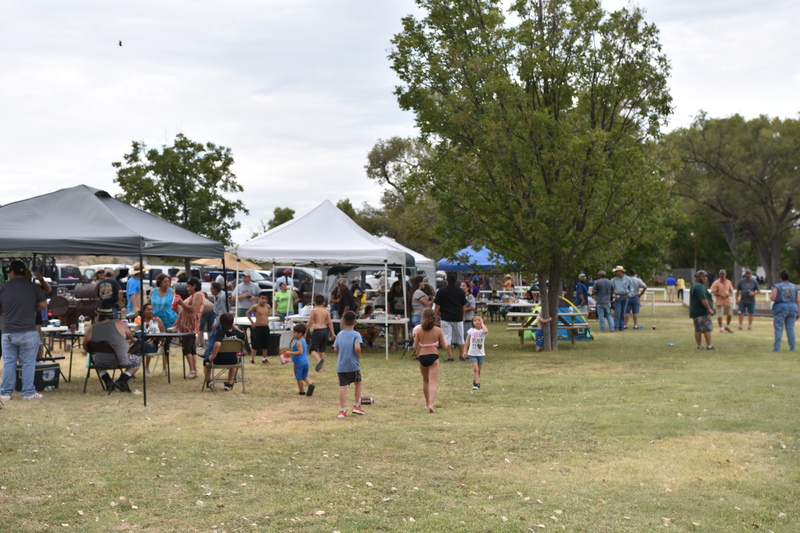 The park is the location for several community shindigs each year, including West Fest – a cabrito and brisket cook-off and Marathon’s Annual 4th of July BBQ and Dance. Dances are held on the outdoor dance floor in the center of the 5-acre park, and there is nothing more quintessentially Texan than enjoying a two-step under the stars to a good local band, which Big Bend has plenty of. The spring-fed pond is regularly stocked with fish and is a popular hangout for locals who enjoy throwing a line – but be sure to bring your own bait. It’s a great place to see wildlife. Mule deer, turkey, javelinas, and foxes are among the critters who frequent the springs, especially around dusk and dawn. 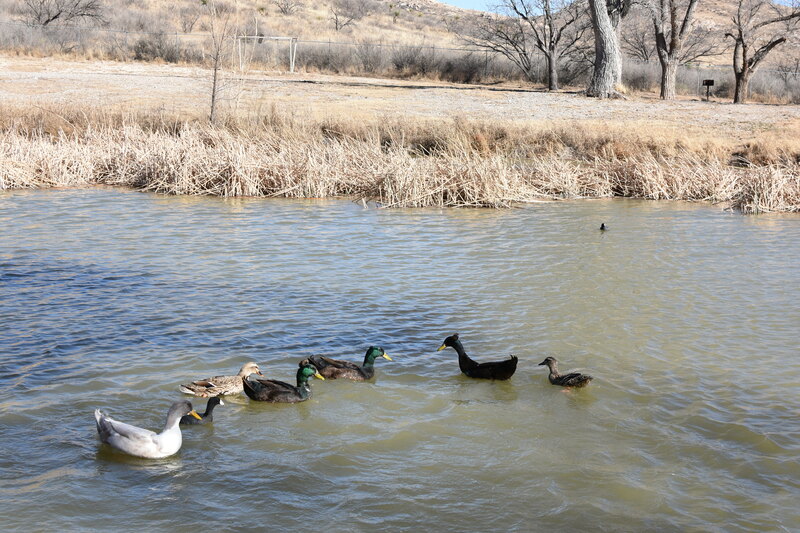 There is a resident flock of ducks, friendly and ready to waddle up for a tasty handout. If you want to feed the ducks, consider bringing a can of corn, duck pellets, lettuce or other greens (torn into small pieces), defrosted frozen peas, rolled or instant oats, or seeds. Many of us were raised feeding bread to ducks, but bread is bad for their diet. This list of acceptable foods will keep ducks healthy and happy! Post Park is a premier mecca for birders. The ease of location and comfort of its amenities, make birdwatching a breeze. Perched comfortably at a picnic table or posted up on the far side of the pond where foot traffic is light and things are quieter, birders will have an easy time ticking off sightings. Hundreds of avian species count this as a stop on their yearly migrations to or from the south. 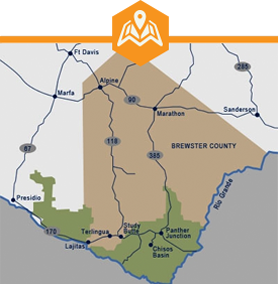 To date, over 400 species have been identified in the Big Bend region, some endemic to various parts, others found passing through. For a more complete birding list, visit https://visitbigbend.com/birding-list/. There’s a good chance enthusiasts will be able to cross off one or more of their “lifers” just by visiting Post Park during migration season. Add Post Park to your list of road-trip destinations in the Big Bend, and enjoy its calm shade and cool waters. Getting here can be half the fun, but not if you don’t plan well. Big Bend is one of the most remote areas of the lower 48 states.